Mozilla’s Engineering Workflow team has created a custom command-line tool, moz-phab, which has better support for submitting, updating, and applying series of commits. It also has conveniences for parsing bug IDs and reviewers from commit-message summaries or specifying them as command-line options. This document is an older guide for Arcanist, the official upstream command-line interface to Phabricator. It may still be useful for those who do not frequently submit patches for review. This guide is a quick overview of how to submit, update, and apply patches with Arcanist. Note that we have written our own guide for installing Arcanist on Windows 10. The official Phabricator documentation also has an Arcanist Quick Start guide, a larger Arcanist User Guide, and a specific guide to “arc diff”. There are a few ways to use Arcanist and Differential. We’ll cover two common use cases: fix-up commits, which is somewhat similar to GitHub’s process, and amended commits, which is similar to MozReview’s model. $ hg add PHABTEST && hg commit -m "Add test file." heartbeat: check all backing services in heartbeat (Bug 1442911). Your commit message will be used to create the revision title and summary. The other fields are optional. If they are given in a similar format in the commit message, the fields will be prepopulated here as well. This includes Bug; omitting a bug ID will result in the revision not being associated with a bug, and thus it will automatically be public. If set, the field must contain a valid BMO bug number. Note that mozilla-central commit policy currently requires a bug number in the commit message under most circumstances. Unfortunately, a limitation of Phabricator currently prevents us from seeding this field with a bug ID from the commit message (at least from the first line, where bug IDs are usually mentioned in mozilla-central changesets). Note that we have worked around these restrictions in moz-phab. You may want to add a reviewer, which should be a Phabricator username (e.g. mcote). You can also add one or more subscribers, who will be notified of updates to the revision. Again, we cannot parse these out of the commit summary with Arcanist, but moz-phab supports this. Note that the commits to be included in this revision are present in the comment at the bottom of the text. You can use this to double-check that you are sending the correct commits to Phabricator. If you visit the revision at the provided URL, you will see that it is labelled “Needs Review”, which is the default state of a newly created revision. It will also be marked “Public”, unless the bug ID you entered is a confidential bug to which you have access. For convenience, an attachment is created on the bug containing just the URL to the new revision, with the description being the revision’s title. Finally, you will also see a few actions on the revision, which are automatically performed by our BMO-integration code. For more on Phabricator-BMO integration, see BMO Integration in the Phabricator User Guide. After your patch has been reviewed, you may have to update your patch and get another round of reviews. As mentioned, there are two ways to do this in Differential. The “fix-up commit” model involves creating a new commit containing the updates. This is similar to GitHub’s standard process. You will end up with a series of commits that should be “squashed” into a single commit before landing, since the fix-up commits are not useful history once a change has landed. $ hg commit -m "Update patch." Your editor will again be opened, but this time the format is much simpler. You just need to provide a change summary, which again is automatically seeded from your commit message. Arcanist should also have determined which revision to update. If for some reason it was not able to, you can use the --update option to specify a revision ID. The other method for updating patches is to amend the commits in place. This is similar to MozReview’s standard process. After running arc diff, an editor is again opened for a change summary, although this time there is no new commit message to use, so we must enter one manually. Once the update is processed, the revision looks very similar to the revision with fix-up commits, except the “Commits” tab of the “Revision Contents” table has only a single entry. The “History” tab, however, is identical to the fix-up commits scenario, with “Diff 1” and “Diff 2” entries, and the same ability to see the different patches and differences between them. It is possible to chain a series of revisions together in Differential, although it is currently a manual process. This feature can be used to represent a stack of commits to split up a complicated patch, which is a good practice to make testing and reviewing easier. You can also add Depends on D<revision ID> to the child’s commit message, replacing <revision ID> with the ID of the parent revision. (This needs to be its own paragraph, separated by a blank line.) The relationship will be created when arc diff is run. Unfortunately there is not currently a way to see a combined diff of all the stacked commits together without applying the commits locally. Also, when you update any commits, you’ll need to run arc diff .^ for each child commit as well. This was the primary purpose of writing moz-phab. 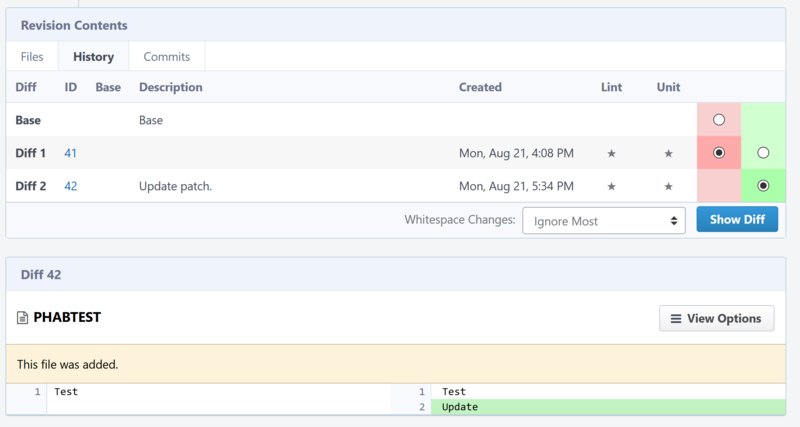 See also this blog post on working with commit series in Phabricator. We will be working on a solution to automate the submission and updating of commit series. It is helpful to understand that arc patch, by default, will not attempt to patch the revision on top of your current working set. Instead, it applies the changes on top of the same parent commit the author used and creates a new commit and a new branch (git) or bookmark (hg). If it cannot find the same parent commit in your local repo then it will warn you and give you the option to apply it on top of the current working set. If you wish to test a revision on top of your current working set use arc patch --nobranch. This is because the first commit now has a different parent and hence a different SHA. You can avoid this problem by updating to the parent of the first commit before running arc patch.